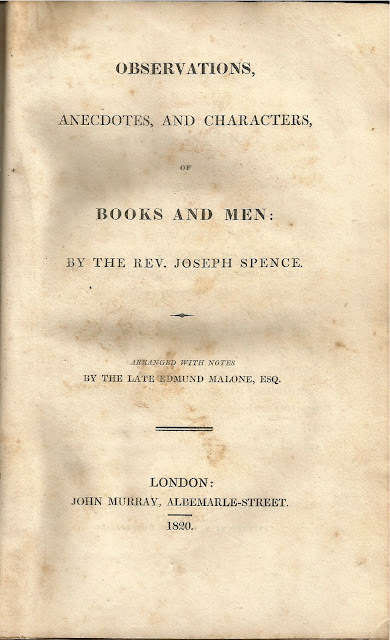 Observations, Anecdotes, and Characters of Books and Men by Joseph Spence, London: John Murray, 1820 (Known as Spence's Anecdotes). Spence's Anecdotes is comprised of three sections: 78 pages of Popiana, 110 pages on English Poets and Prose Writers, and 109 pages of miscellaneous articles. The anecdotes about Alexander Pope provide a behind-the-scene look into Pope's life, his writings, and his dealings with other writers. In the second section, Spence provides anecdotes or observations on many of the poets that are included in Johnson's Poets as well as anecdotes on some prose writers: Beaumont, Fletcher, Milton, Waller, Cowley, Denham, Stanley, Otway, Butler, Lee, Rochester, Dorset, Shadwell, Settle, Sprat, Etheridge, Wycherly, Sheffield, Hughes, Fenton, Parnell, Gay, Garth, Congreve, Vanbrugh, Farquhar, Rowe, Young, Addison, Philips, Bacon, Newton, Locke, Marborough, Bolingbroke, Oxford, Atterbury, and more. In the third section, Spence touches on everything from Virgil to Dante to Oliver Cromwell. Included in this section are nine pages on China and the Chinese, beginning with the emperor Chi Hoangt, who began his reign 246 years before the birth of Christ. Of special note, and worth researching are the anecdotes of Monsignor Fauquet (Bishop of Eleutheropolis, then (1732) residing in the College de Propaganda Fide, at Rome), who spent twenty years in China as a missionary. Fauquet spoke in depth of the sacred writings of China and how closely related they were to the writings of the Christian religions. He brought almost 4000 books out of China, lost half of them on the way, and planned to publish several of them. In an editor's note, Malone reveals that he acquired the list of books Fauquet planned to publish from his friend Chevalier. All told, this is one awesome book, and for only $5.00 on eBay! I was browsing Henry G. Bohn's revised edition of The Bibliographer's Manual of English Literature one day—just to see what it had to say about some of my books—and when I came to Bohn's listing of Spence's Anecdotes, I did a double take! 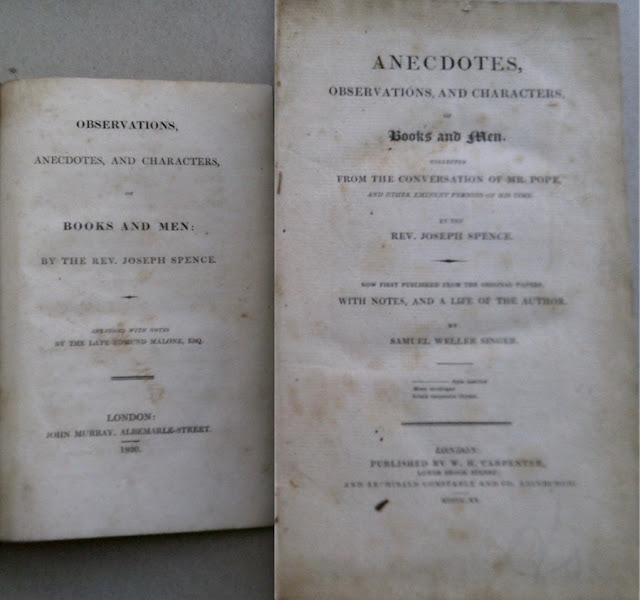 Henry Bohn listed two editions of Spence's Anecdotes! And with differently-worded titles. And both editions were published in 1820? That had to be a mistake! 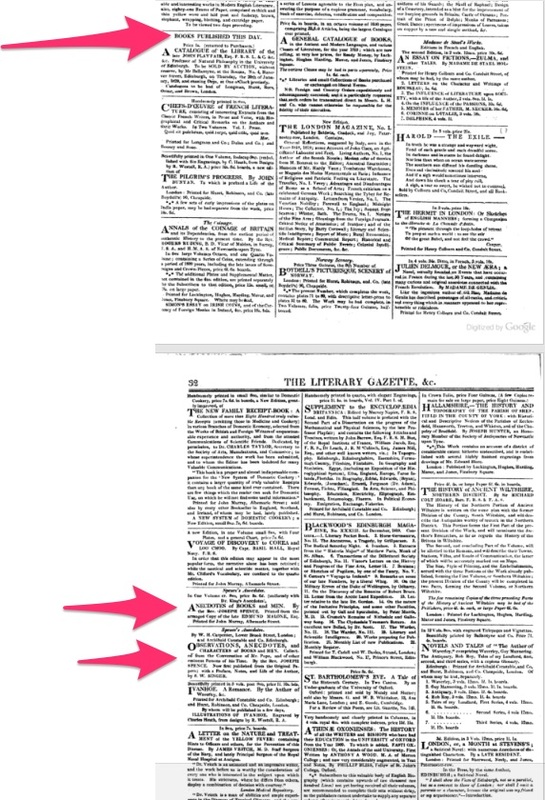 But when I read the article Bohn cited in the Quarterly Review, I discovered that not only were both editions published in the same year, they were published on the same day! As you can tell from the picture, Singer's edition of Spence's Anecdotes is significantly larger than Malone's edition. And, yes, I acquired a copy of Singer's edition of Spence's Anecdotes as well. And another copy of Malone's edition; this one formerly owned by the flamboyant publisher of the New York Herald, James Gordon Bennett Jr. 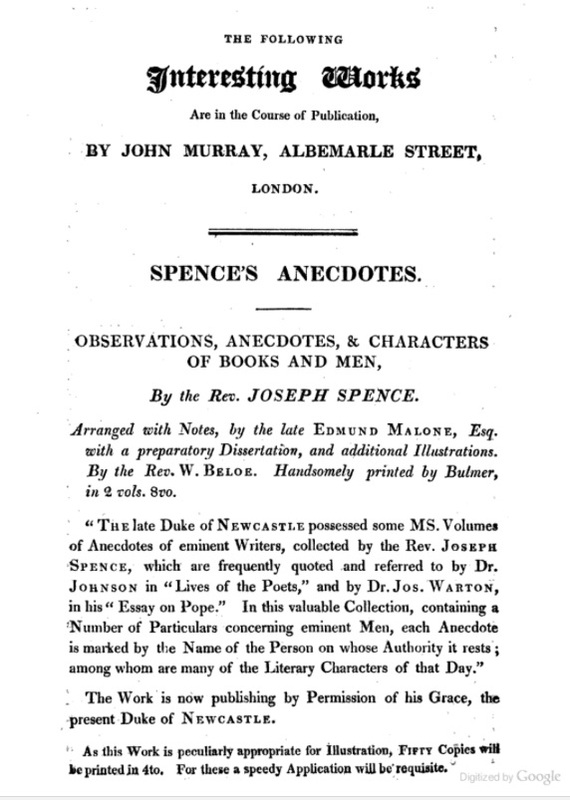 The definitive book on the history of Spence's Anecdotes before, during and after it was first published in 1820 has already been written—by James M. Osborn. And yes, I have a copy of that book as well. It took Osborn twenty years of collecting, researching, writing, and editing to complete his book—and in two volumes: Observations, Anecdotes, and Characters of Books and Men, Oxford: At the Clarendon Press, 1966. Osborn is my primary source in telling you the story of Spence's Anecdotes. But I will cite other sources, including the aforementioned copy of the Quarterly Review. And yes, I have a copy of that too. Joseph Spence (1699-1768), a close friend of Alexander Pope, was an Oxford Professor of Poetry, and later Regius Professor of History. He was widely known to the literary men of the middle part of the eighteenth century. And he put pen to paper, recording numerous anecdotes and observations about them, particularly about Alexander Pope. Spence permitted Joseph Warton and William Warburton use of his papers for their works on Virgil and Alexander Pope. 4. The said Mr. Spence doth hereby, for himself his Executors Administrators & Assigns sell and assign to the said James Dodsley his Executors Administrators & Assigns the sole Right of all Copies which he the said Mr. Spence hath not yet published, and which the Executors of the said Mr. Spence shall judge proper to be published (Osborn lxxxvi). Joseph Spence died suddenly on August 20, 1768. 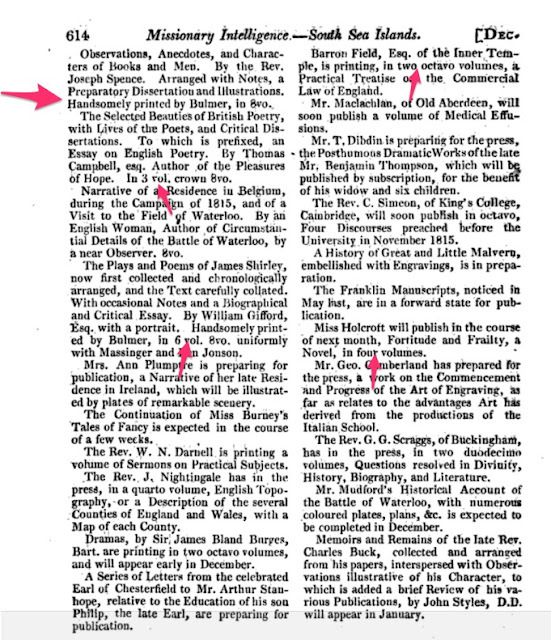 And on September 5th, James Dodsley requested a copy of the anecdotes "as soon as possible" so he could publish them. 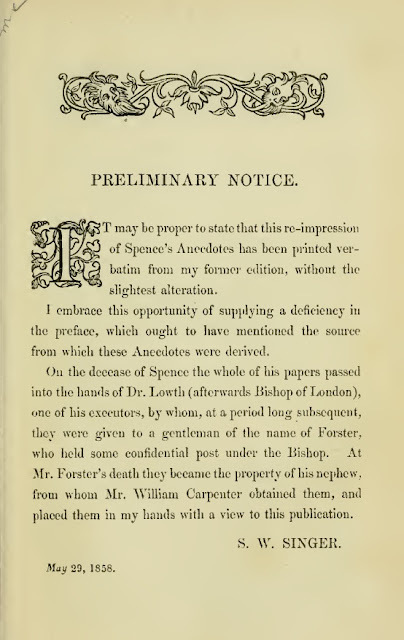 But the executors of Spence's estate, Robert Lowth (Bishop of Oxford, and an Oxford Professor of Poetry as well), Dr. Gloster Ridley, and Edward Rolle, discussed the matter and decided that the manuscript of Spence's Anecdotes should not be published. They reasoned that the public had already seen parts of the manuscript from the writings of Warburton and Warton and that the remainder of the manuscript should be suppressed. Spence's executors deposited the manuscript with the Duke of Newcastle, one of Spence's pupils, for safekeeping. But this manuscript was reportedly the only item of Spence's Papers that the executors deposited with the Duke. The public received additional bits of anecdotes when Samuel Johnson was permitted use of the manuscript in 1780 for his Lives of the Poets. 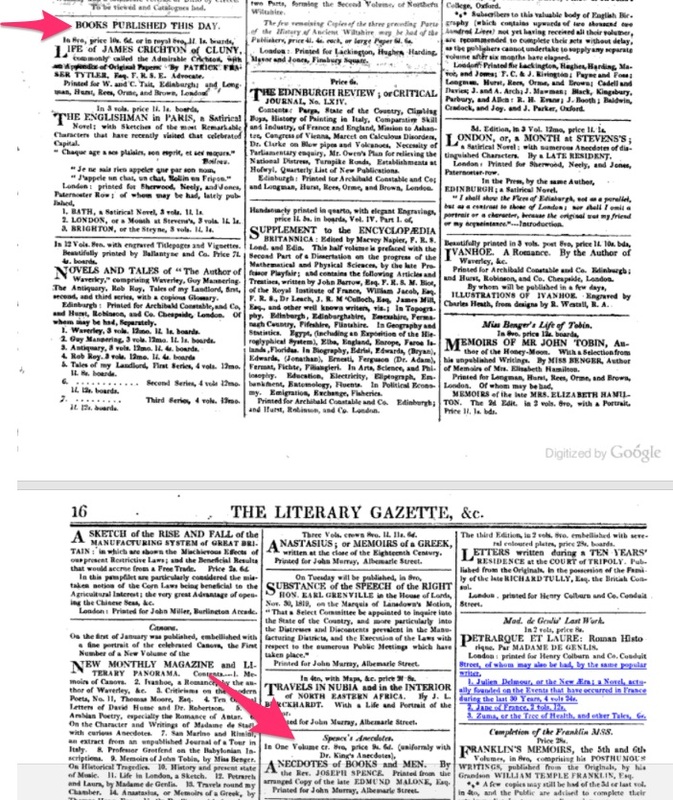 And in 1794, Edmund Malone was permitted to use it for his work on Dryden and others. The Newcastle Manuscript, as it became known, was divided by sections of years. But Malone revised it in a new transcript for his own use, dividing the anecdotes into three sections: Popiana, English poets and prose writers, and miscellaneous articles. Edmund Malone died on May 25, 1812. And here is where the history of Spence's Anecdotes begins to get a little murky. In the Quarterly Review article, the anonymous author, later identified as Isaac D'Israeli, stated that the Malone manuscript "was given to the late Mr. Beloe, who sold it to Mr. Murray (402)." Osborn, who cites Wright several times in his book, does not mention Wright's assertion that Beloe acquired the book and sold it to Malone. Instead, Osborn refers to Malone's will in which Malone left James Boswell the Younger with "£200 and the superintendence of his scholarly books and papers. Among them , of course, was the transcript of Spence's Anecdotes (xcvi)". Osborn also notes that Malone's transcript of Spence's Anecdotes was listed as lot 3111 of the 1825 auction catalogue of the library of James Boswell the Younger. And here's another advertisement that was included in an 1815 edition of The Miscellaneous Works of Edward Gibbon, also published by Murray, but not listed as "2 vols.". It is possible that Murray already realized that Spence's Anecdotes could not be stretched to two volumes. 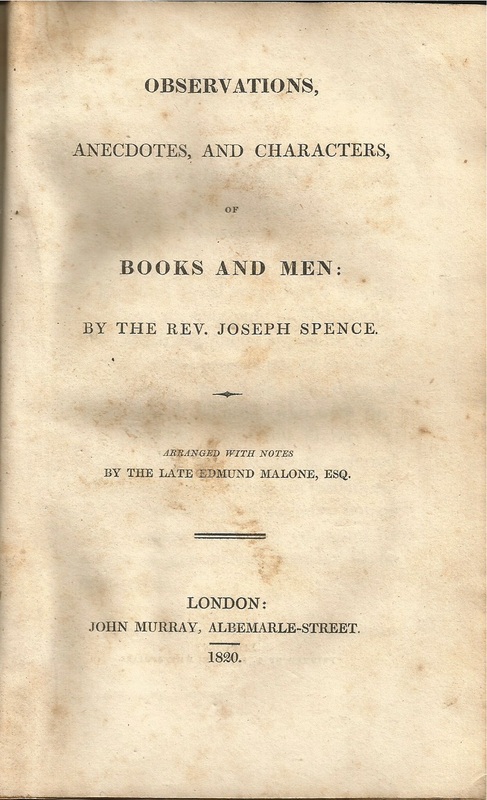 Murray never published an edition of Spence's Anecdotes that was edited by William Beloe. Both D'Israeli and Wright state that Murray himself suppressed its publication. But that may not be the case. Osborn notes that in 1815 the present Duke of Newcastle requested to see the Malone Manuscript and that Boswell sent it to him. How long the Duke kept this manuscript is undetermined. Beloe took ill and died in April 1817. It is possible that Beloe never had the opportunity to edit Malone's transcript of Spence's Anecdotes. John Murray was surprised when he heard that Singer's edition was about to be published. And he quickly arranged to publish Malone's edition. And according to D'Israeli's article in the Quarterly Review, both editions were published on the same day. Osborn goes further, and in his book he identifies to the date when the two editions of Spence's Anecdotes were published: Jan 20, 1820. 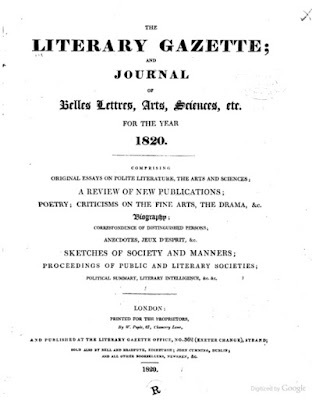 Singer's Preface is dated 19 December 1819 and the volume apparantly was published on January 20.2 According to report, the Murray edition appeared on the same day (xcviii). 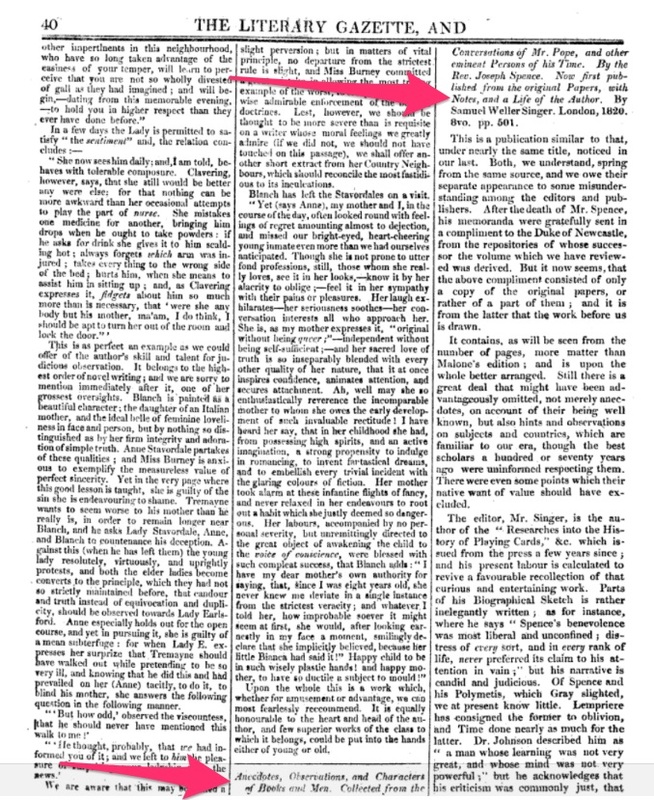 2 See Wright's detailed account of the publication and press notices, pp. 182-5, 250-1. Osborn was referring to Austin Wright's book, Joseph Spence: A Critical Biography, Chicago: University of Chicago Press, 1950. 32 Quarterly Review, XXIII (1820), 401. 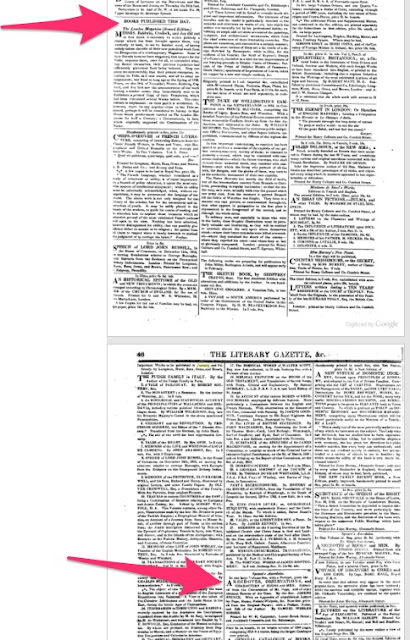 The Times for January 20, 21, and 22 carried an advertisement of the Singer edition as being published "this day." 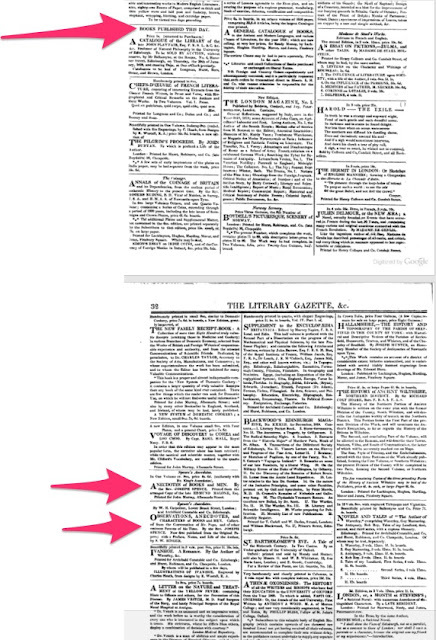 Here's the notice from The Times for Jan 20, 1820. The notices for the 21st and 22nd were identical to this one. 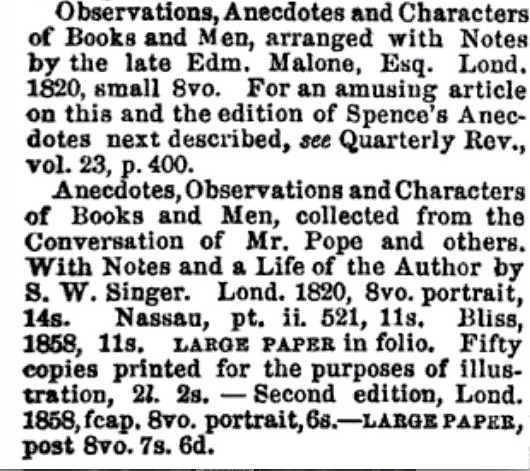 I find it interesting that a notice for the publication of the Malone edition of Spence's Anecdotes never appeared in any January 1820 issues of The Times. 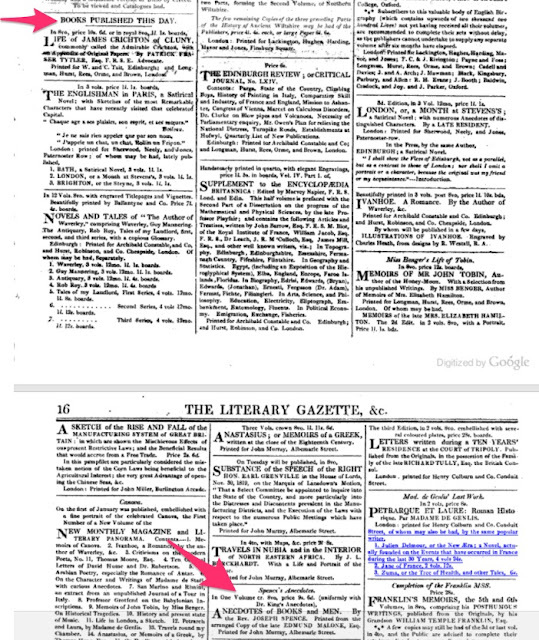 But more interesting are the "Books Published This Day" notices of the publication of Spence's Anecdotes which appeared in some of the January issues of The Literary Gazette! 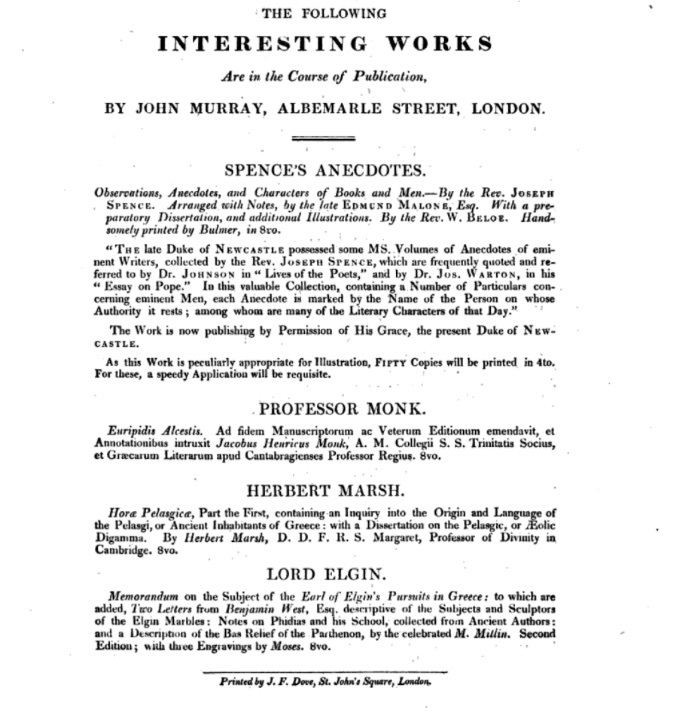 Both editions of Spence's Anecdotes may have been published on the same day. But I believe that day was not January 20, 1820. They were published earlier that month. On what date(s) were they published? I will leave that to the scholars to determine. 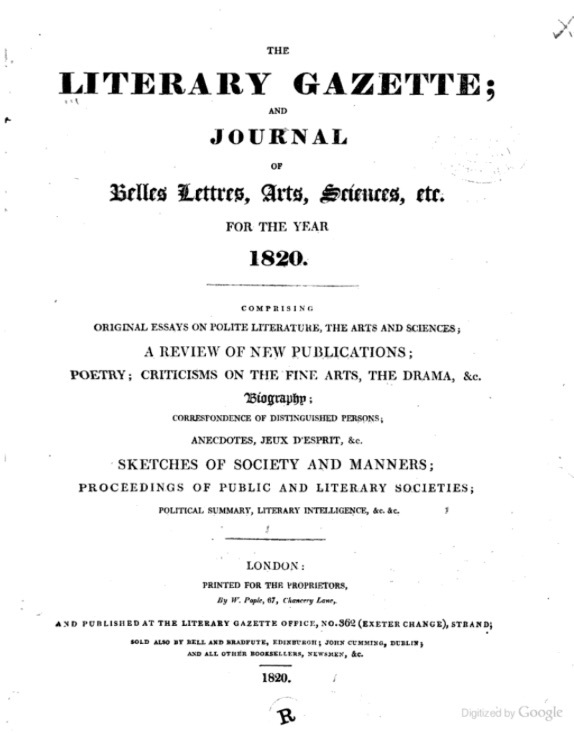 Both editions of Spence's Anecdotes were reviewed in The Literary Gazette; the Malone edition on Jan 8, 1820, and the Singer edition on Jan 15, 1820. Neither edition received a raving review. According to the reviewer, Malone's edition was "carelessly done." 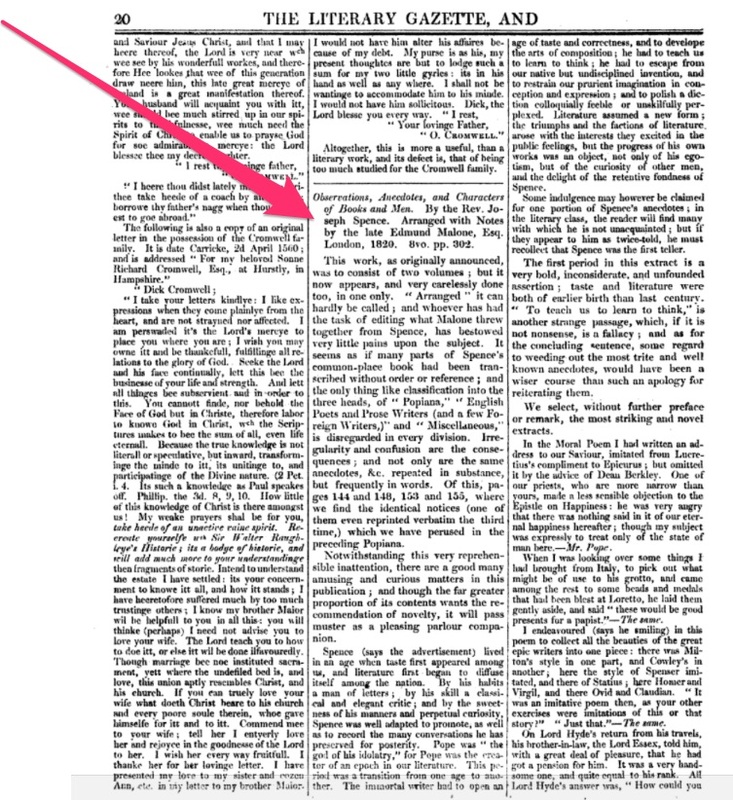 And the Singer edition contained "a great deal that might have advantageously been omitted." Finally, here's one last bit of information from Osborn, and this concerns the identity of the person who wrote the six-page Advertisement for Malone's edition of Spence's Anecdotes. Osborn believed it was written by the very person who was in possession of Malone's Manuscript: James Boswell the Younger. Osborn believed the "style and tone of it" said "Boswell." Osborn added, "Perhaps some day some substantiating evidence may come to the surface." If this blog post has piqued your interest in Spence's Anecdotes, you will want to read Osborn's book: Observations, Anecdotes, and Characters of Books and Men. Osborn's edition contains, by his count, 1,648 anecdotes—500 more anecdotes than what appeared in Singer's edition. What's more, Osborn covers the various manuscript sources and their locations. Most of Spence's Papers and manuscripts are in the Osborn Collection at Yale University. Malone's manuscript is in the Folger Library. MS. B? Who knows? According to Osborn, it was last seen in 1858. Has it resurfaced since Osborn's book was published in 1966? Good question! I would like to know! Having been reading a lot of Pope recently, as well as about Pope (including Johnson's effort in the Lives of the Poets), it occurred to me a day or so ago to start looking for Spence's Anecdotes, of which I knew nothing. Surprisingly (to me), Gutenberg didn't have it. But Hathitrust and IADb did have it. 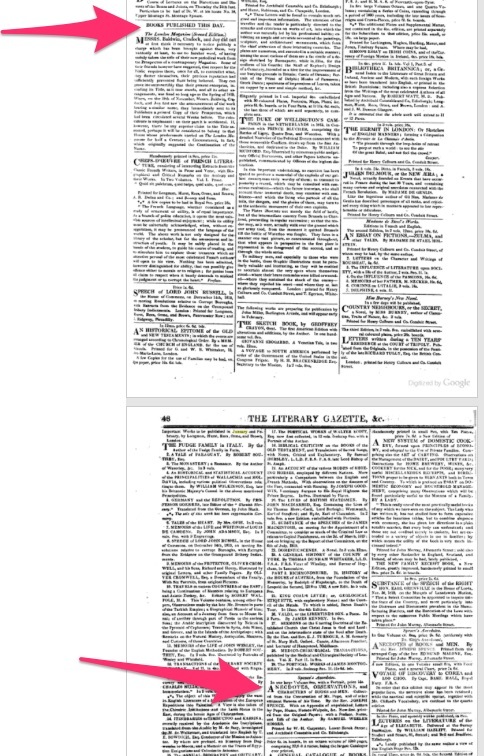 Knowing that Gutenberg didn't have it, I wondered whether any of the other internet reprint websites might have their own copies, so I googled it. And found this blog with the mind-blowing history of the book. Very strange, at least to me, not an accomplished bibliophile or scholar. Now I'm all on fire to get a copy of Osborn's book. Five dollars on Ebay? Aghfhap: I paid $5 for an 1820 edition of Spence's Anecdotes, but that was over 15 years ago. I paid around $30 in 2016 for Osborn's two-volume work on Joseph Spence: Observations, Anecdotes and Characteristics of Books and Men.